The biggest surprise for visitors to Denver is the climate. The arid conditions bring only 8 to 15 inches of annual precipitation and locals wake up to more than 300 days of sunshine a year. That’s more annual hours of sun than Miami and San Diego. Winters are mild with an average daily high temperature of 45 degrees Fahrenheit and days reaching 60 degrees are not uncommon. Snow doesn't stay on the ground long in Denver so golf courses and outdoor cafes are able to stay open all year. In summer, Denver enjoys low relative humidity, making for beautiful, sun-filled days and cool, comfortable evenings. The average daily high temperature in August is a mild 86 degrees Fahrenheit. The mild weather is due in part to the city's altitude: 5,280 feet above sea level, or exactly a mile high. If you're offline and looking for that personal touch, head to one of the city's three conveniently located Tourist Information Centers (TIC). From the stately Victorian houses of Five Points to the hip restaurants and nightclubs of historic LoDo, Denver's laid-back attitude is exemplified in its neighborhoods. Welcome to Denver, where 300 days of sunshine, a thriving cultural scene, diverse neighborhoods, and natural beauty combine for the world's most spectacular playground. Don't let anything you hear about the mile-high altitude scare you. The air is just thinner and dryer. The biggest surprise for visitors to Denver is the climate. Don't miss out on an opportunity to see Denver's MLB, MBA, Lacrosse and/or Rugby team in action! 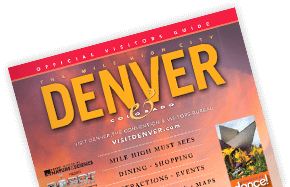 Denver is a "natural" fit for green meetings and events. As of January 1, 2014, it is legal in Denver for adults over 21 to purchase marijuana for recreational use.